A woman calls into Blog Talk Radio with a couple of questions about conception while beginning menopause at 47 years of age. Her FSH has been high and periods erratic tells us that she is early part of menopause, this does not mean she cannot conceive. Susun talks about genetic material and the likelihood of miscarriage. Susun talks about vitex tincture, red clover infusion, animal fat at every meal and petitioning the soul of your unborn child. This audio is 8 1/2 minutes in length. Susun Weed shows us her Chaste berry aka Vitex. Chaste berry is a wonderful herb for womens issues. A caller says she has an issue with cysts on her ovaries and would like recommendations. Susun asks some questions and the caller says the cysts are large and the doctors want to do surgery. Susun talks about chickweed tincture. This audio is almost 6 minutes long. Join Susun Weed on blogtalkradio, Tuesday nights 7:30-9:30 pm EST. Call or Skype in: 1- 646-929-2463, with your questions or email ahead of time to wisewoman@herbshealing.com. A caller on blogtalkradio, asks about fertility, she is 47, was tested for any issues, her fsh is high, and her periods are irregular. Susun says those are signs of early menopause, but that pregnancy is still possible. She talks about vitex tincture and red clover infusion. This audio is just over 8:00 minutes long. 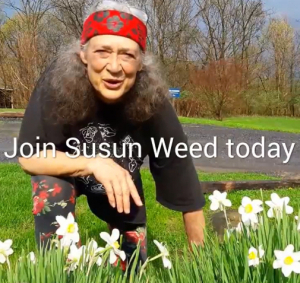 Join Susun Weed on blogtalkradio, Tuesday nights 7:30-9:30 pm EST. Call or Skype in: 1-646 -929-2463, with your questions or email ahead of time to wisewoman@herbshealing.com. Susun Weed and her granddaughter, Monica Jean discusses the benefits of red raspberry leaf and demonstrates how to make a nourishing herbal infusion. I have a growth in my uterus and i am wondering if chickweed tincture would work to shrink that? Also is the tincture the same as extract? Can you help me clear my fallopian tubes? Also from Susun: "I know many women who were told their tubes were damaged but who conceived without IV. What did they use? Red clover infusion. (Not tea, not tincture, not capsules...) ... During this time, visualize your tubes opening and accepting your egg and then your lover's sperm...."
If you're ready to go deeper with your herbal studies, join Susun on her Mentorship website. Get new content weekly such as the expanded herbal ezine, replays of teleseminars, videos, audio of Susuns past lectures, many articles by Susun, and even personal one on one mentorship from Susun. I having been reading your article on conceiving after 47 and i am greatly impressed with giving me hope that i can still conceive at my age. I would like to know if there is a way i can get the red clover and other herbs that would help me conceive. I have endometriosis and blocked fallopian tubes. I have done ivf and it failed, please i need help. I am writing from Nigeria. Thanks as i axiously await your response. I was so happy to see you on the internet. I am 38 and just found that I have blocked fallopian tubes. I also have high FSH (13) and low AMH. I would like to go a holistic way to conceive. The doctors want to send me straight to IVF. I have just started taking Red Clover, Red Raspberry leaf oil, Aloe, Fenugreek in addition to my iron pills and prenatal. Is there anything you can suggest to help unblock my tubes and help my numbers? I'm also trying castor oil massages for my tubes. I would like to eventually start acupuncture.